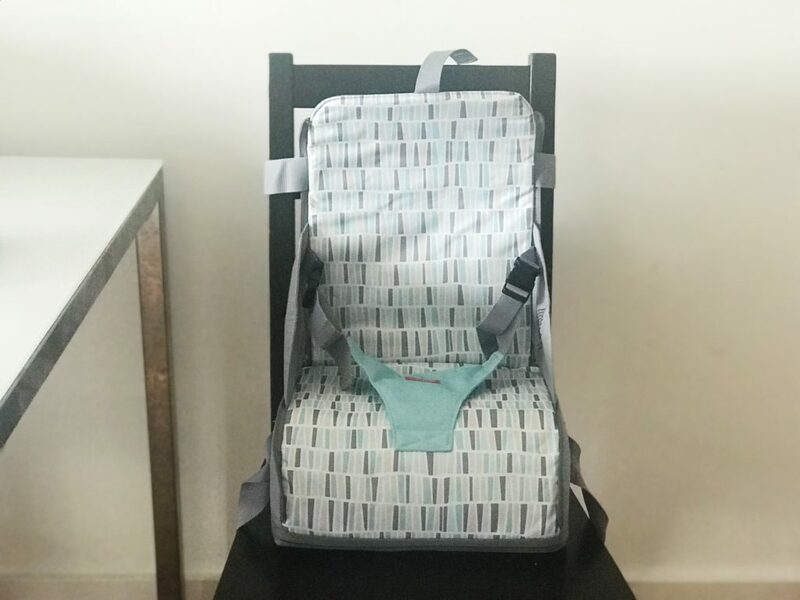 We’ve been Nuby brand reps for around four months now and have been sent lots of gorgeous toys and accessories to use on our weaning journey, but last week the best item we’ve had yet arrived and I’m so pleased with it that I just had to share on the blog; it’s the Nuby travel booster seat. I’ve been very open about Dexter’s weaning journey from baby led weaning to toddler led feeding and it’s been incredible to watch him grow from a tiny baby who could just about stuff a tiny pancake in his mouth to a small child who uses cutlery to spoon pasta into his mouth while sat quietly at his Ikea table and chair. 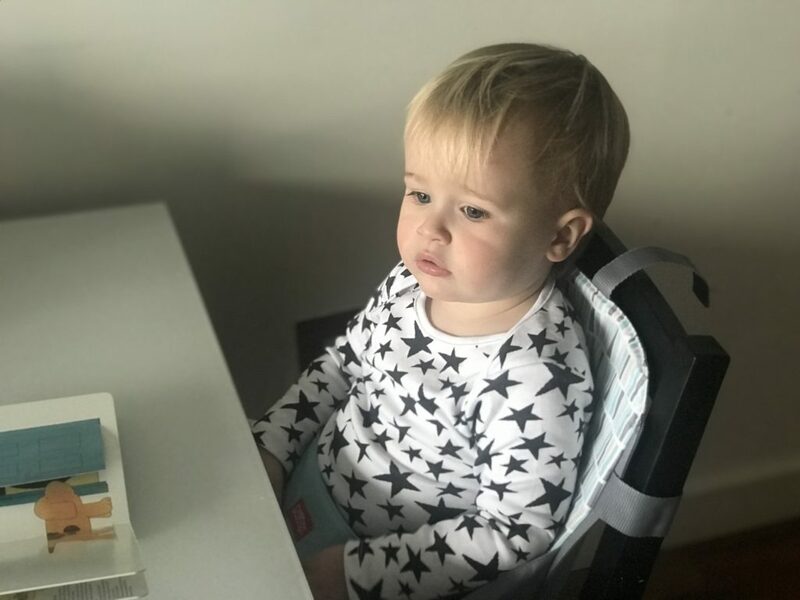 We’ve used the high chair less and less until we found that he was eating most meals at home at it his little table and chair, however this didn’t sit comfortably with me as it felt like he was segregated from us and mostly he was glued to the television while he wolfed his food down. I really wanted to have him sit at the table with us but in all honesty, despite him being tall for his age he wouldn’t have been able to sit comfortably on one of our chairs and he wouldn’t have been able to reach the food on the table. Luckily this is where Nuby stepped in and offered us one of their booster seats and I am in love. 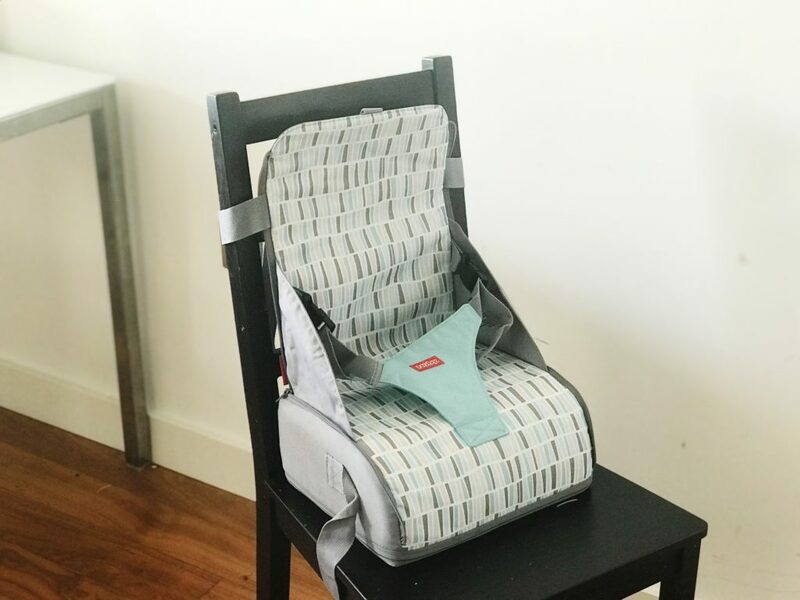 The Nuby travel booster seat will fit on any chair and you simply adjust the straps to secure it against the back of the chair and underneath. 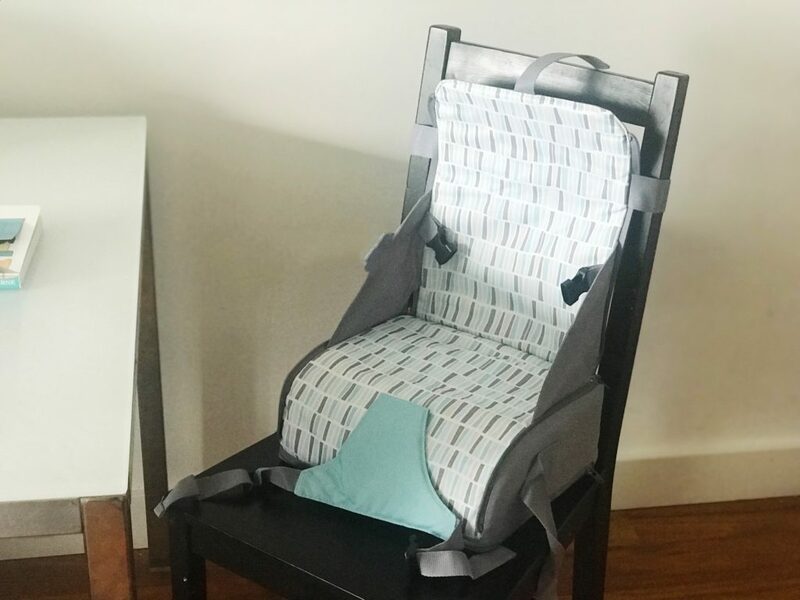 It comes with a padded bottom which boosts baby/toddler so he can reach the food on the table, as well as two clips so he can be securely strapped in with no concerns he will fall out. 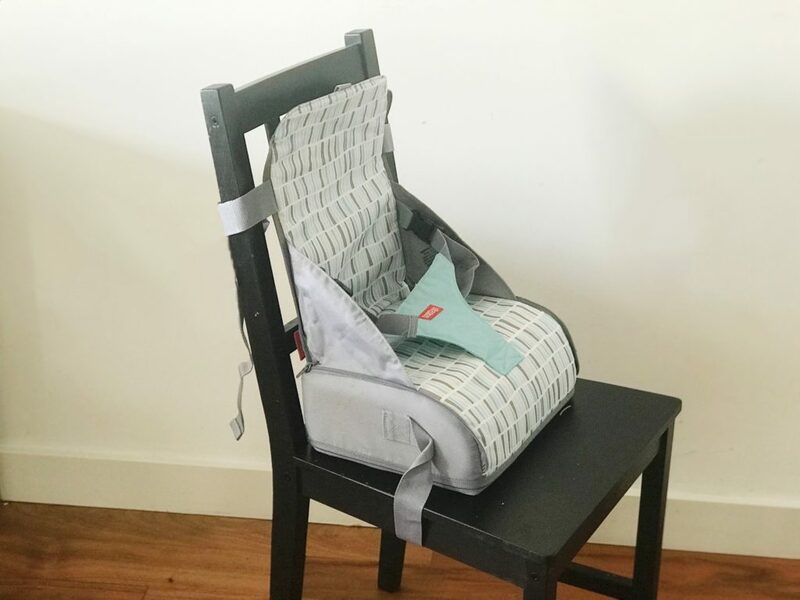 No longer do we need to worry if our favourite restaurant has a high chair available for us, the Nuby travel booster seat folds up to create a small satchel which you can conveniently carry on your shoulder along with your changing bag. Since the introduction of the booster seat, I’ve noticed that Dex is more chatty during meal times and much more interactive. He tries to pinch food off my plate using his fork and tries to feed me food from his plate too. He watches with great interest as we eat and tries to mimic our actions by smacking his lips together and exclaiming FINISHED when he’s done. As much as I loved our high chair, I am kind of glad that period of our life is done and dusted and we are moving onto the next level. Mealtimes suddenly feel more intimate and we feel more together as a family. 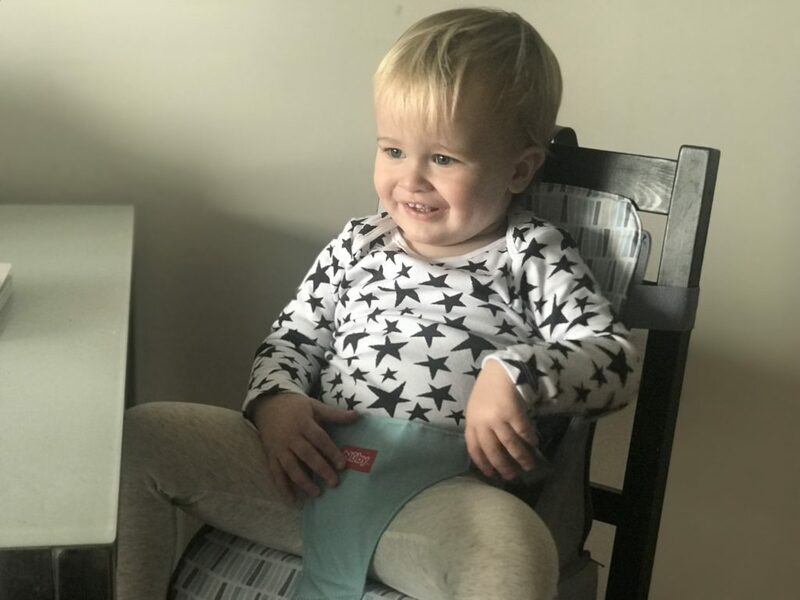 If you are looking for a booster seat then I highly recommend this Nuby Travel Booster which is not only great for home but for anywhere you might go, whether that’s Nanna’s house or Pizza Hut! Disclaimer: I was given this booster seat in return for an honest review. All opinions are my own. This is a great seat. I’m a big fan of seats that make little ones feel part of having dinner with the family! That looks fab! I love the design of it and that it’s practical and does the job too. It’s great when they can sit at the table with you, I was so glad to see the back of our high chair! The highchair is just so bulky and taking up essential space! What a good idea! We have a travel booster that’s a little like this but doesn’t have as much padding in the base and because of that he’s still a little too small for the table at times! The Nuby one looks perfect though. It’s so nice when they can be a part of things, I swear it makes them grow up in seconds! Toddlers are just so keen to do what everybody else is doing! 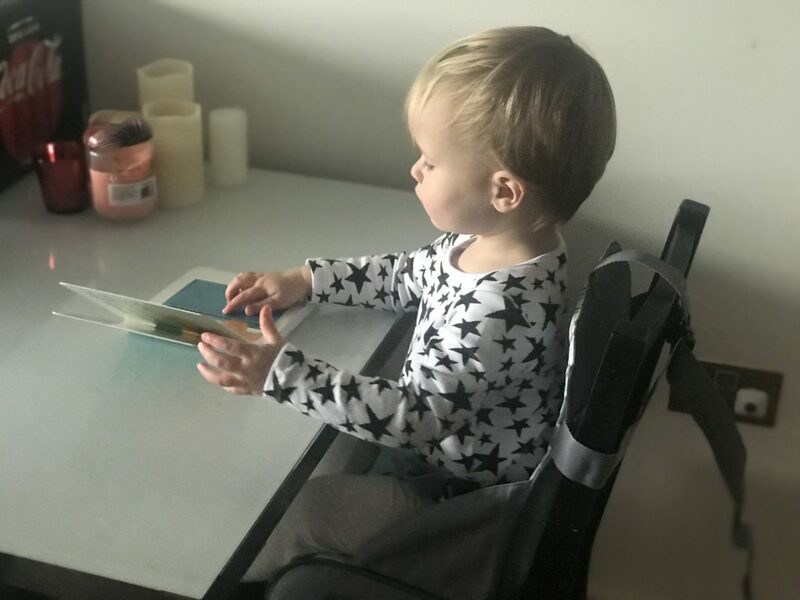 These booster seats are fab – i had a similar one for my daughter and it meant we could all eat dinner around the table together and like you say, they are not segregated from the rest of the fam! It looks super comfy too! It is very comfy! We used it in Frankie and Benny’s recently and it meant he was really part of the dining experience. We have a very similar one to this that we bought at Christmas when we were going to visit family. He wasn’t the biggest fan at the time but I think I’ll be trying it again because he’s a bit annoyed with his high chair and it would be nice to not need that clunky thing anymore! Oh they take up so much space don’t they?! Oh he’s so beautiful! I feel you, I’m excited to get rid of the highchair now if I’m honest, we barely use it anymore. This looks so handy for days out, or even when we pop around to friends / families who don’t have a high chair. It certainly is! Yup those pesky child free friends!! 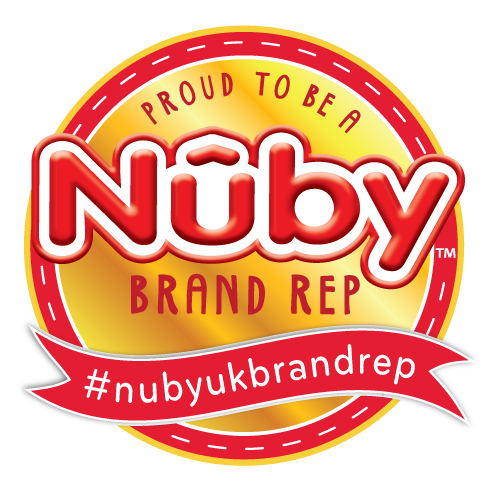 The NUBY stuff is fab – I’m not surprised this is great as well! We’ve not started looking at Boosters yet but I think we are going to have to soon as H is determined to sit at the table! Ahh little H – he’s growing so fast! I’ve tried so many amazing Nuby products! I found your website from Google and I need to say it was a fantastic find.